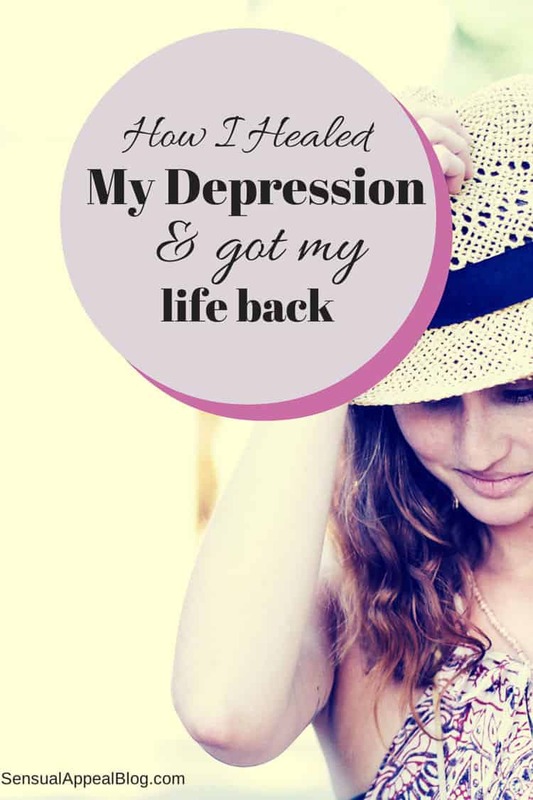 In this post, you will learn the steps you can take to move towards how to heal depression, like I did, and get your life back for good. Have you ever felt exhausted, lethargic and with no interest in life? Have you ever felt like there is no escape and you’re just surrounded by darkness and nobody could understand what is happening to you? Would it make a difference for you if I told you how I healed depression? Years ago, I was diagnosed with fibromyalgia, chronic fatigue syndrome and depression. Suddenly all my life got upside down and I couldn’t even understand how all this was happening to me! I thought I had a good life! I wasn’t rich but I wasn’t poor. Not everything was pink roses and champagne but I was happy and let’s say content with my life. Imagine my surprise when I got so sick I had to crawl on my bedroom floor to reach my phone and call for help. Fast forward two years, I was mostly living in bed, going from doctor to doctor and trying to make sense from all this craziness. At that time, I’ve added a couple of other things on my list: severe allergies, migraines, hypothyroidism, miscarriage, kidney stones surgery to name just a few. Lots of clients asked me how I healed depression. How did I get my life back? Was it just a miracle or is it possible for other people too? I set at my desk and made a list with the steps I took during those two painful years. I can only hope these lines are going to provide some guidance in your journey to get healthier and have a better, happier life! 1. I realized I had to take control of my life. I wasn’t going to get better if I let myself in the hands of other people. When I say people, I don’t mean only doctors; I also mean your friends and family. Some of you might have the support you need from family; some of you might struggle especially because you don’t get any understanding or support at home. If you’re one of the people who are not really supported by family and you’re feeling like you’re all alone battling your “disease”, don’t give up! 2. A diagnosis is just a diagnosis! 3. Like everything else in life, you have to be ready, willing and committed to your goal of getting healthier. If you still have fears and doubts and you’re not quite ready, look at the things that are making you feel that way. To give you an example: You might look for affection and more emotional support. If you got it when being sick, you probably aren’t ready to give up that emotional support. Practice going with the flow and follow your intuition. Whenever I have fears or worries, I start looking for the root cause. Be honest with yourself! Instead of asking other people, look inside your soul for the answers! I meet obstacles in my life on a daily basis! If I’d worry about all, I’d surely be back where I was years ago. If I am ready, willing and committed to overcome those obstacles then it’s time for planning, organizing and taking action. What if you still have doubts deep inside you? What if you feel so much confusion that you don’t know what’s wrong and what’s right anymore? STOP thinking about the problem and clear your mind. Take a walk, listen to some music or do whatever gives you joy. After that, come back and write down everything. This way you’ll get more perspective and clarity. Write down what you think is the root cause of your problem. Write down your fears, worries, and doubts. Write down the people and situations you still can’t forgive. When you’re done, make the conscious choice of letting go all those things you wrote down. At the end of this process I’m sure that you’ll discover many things about you. You’re going to feel more connected to your true self and you’ll also have more confidence in what you can achieve. You might think, “What about the obstacles, limitations and negative thoughts coming from other people?” or, as someone was asking me some time ago, “What about karmic issues?” Each of your doubts and fears will be reflected in your external world. Your negative feelings and thoughts will make you resonate with people struggling with similar problems. Ironically, it can take more time to realize you have a negative thought than it will take for that thought to affect your physical body! It takes just 40 seconds for a negative thought to start affecting your physical body. 6. planning, organizing and taking action! By the way, don’t skip one step if you want to see results. When I say planning and organizing, I mean writing down all the things that need to be changed in your lifestyle so you can regain your health. Maybe you’re not used to make a plan for your health or for your life and maybe you don’t know where to begin. My advice is look at the whole issue as planning a business or any other project. When you decide to move to a new place, you plan the moving and than you do it. It is exactly the same thing but this time you’re planning to get healthier. Your body is affected by what you eat, drink, breathe and put on your skin. You will have to make better food choices, stop using chemicals on your skin, add super foods and herbal remedies to support the detoxification process and start exercising. I am not saying it is easy and I am not telling you to change everything over night. It will take some time and you will probably need some help when it comes to planning all these changes. If you need help with the planning, email me at iuliana@designingabetterlife.com for a complimentary session! Remember, everything is set into motion by our choices! Choices are made on our conscious level. No matter how many things or people influence you, you still have the power of your own choices!